Find the user using the Search field or by paging through the list. Click More and from the menu that appears, click Edit Person. 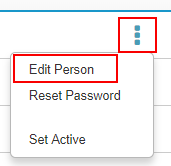 Open a role to edit the permissions by clicking the link in the Roles column.